Thank you to everyone who made London Super Comic Con a huge success for Alien in the Outfield. Having previously enjoyed the well organised, well attended and friendly atmosphere at the UK’s largest dedicated comic convention, the Alien in the Outfield creative team had always been keen to launch issue one of our comic at this event. During the day, writer Jack Kirby and artist Mat Barnett diligently signed copies and attempted to attract interest with a wide selection of bribes including stickers, badges and Alien themed cupcakes. The cupcakes were especially popular and there were only a handful left on Sunday when the green decoration enabled us to repurpose our promotional baking as a St Patricks Day crossover. We were lucky enough to have veteran exhibitors Anastasia Catris and Al Davison on hand as our accommodating neighbours. Anastasia not only watched over our stall during our occasional absences but had been subjected to our relentless sales pitching for so long that she even managed to sell some copies of the book on our behalf. I would strongly urge you to check out her bold and beautiful illustration. On Saturday afternoon, we were joined by our guest cover artist for issue one, Ted Haddon. Ted is a talented painter and we are grateful to him for contributing to our first issue. He would later also contribute some sick B-boy dance floor moves during the after party at the Fox. 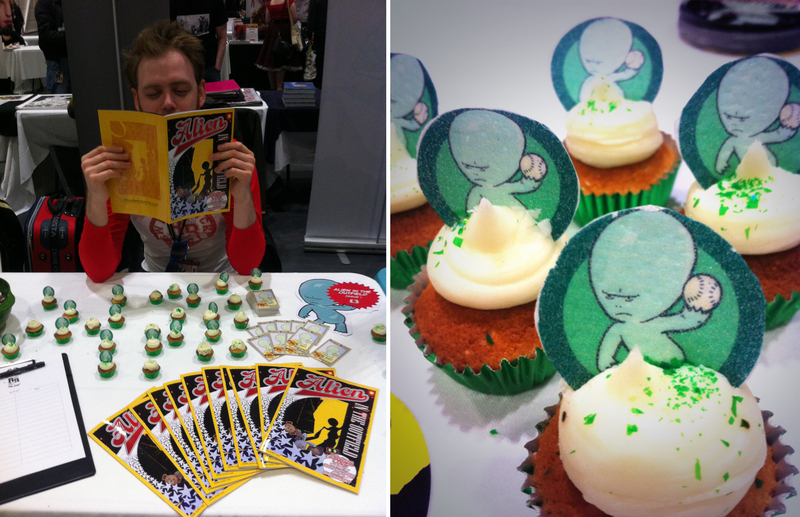 Huge heaps of thanks are due to all our friends – new and old, comic fans or otherwise – who stopped by to support us. Finally, special mentions should go to Jack’s Dad and our good friend Ami, both of whom donned a baseball jersey to join Team Alien and help us shift, staff and promote over the weekend. By Sunday morning, our hangovers did little to dull the surprise that we had very nearly sold out! 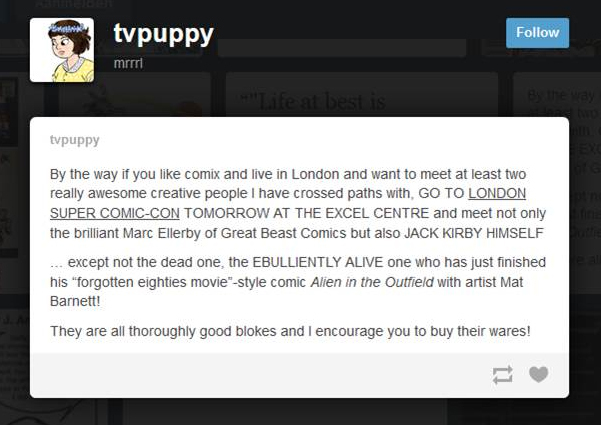 Initially we were unwilling to actually accept this unexpected turn of events as an endorsement of our little comic. We instead considered it may have been a result of the limited range of other all-ages material at the Con. We also observed that our title had placed us at alphabetically at the beginning of Artists Alley where we may have benefited from the generosity of new arrivals eager to break into virgin wallets & purses. Finally, we conceded that we had possibly created a story that people seemed to quite like and allowed ourselves a modest under-the-counter high-five. Nevertheless, it seemed that whatever little Gods are tasked with the patronage of all-ages alien sports adventure comics were looking down on us…and they were pleased. 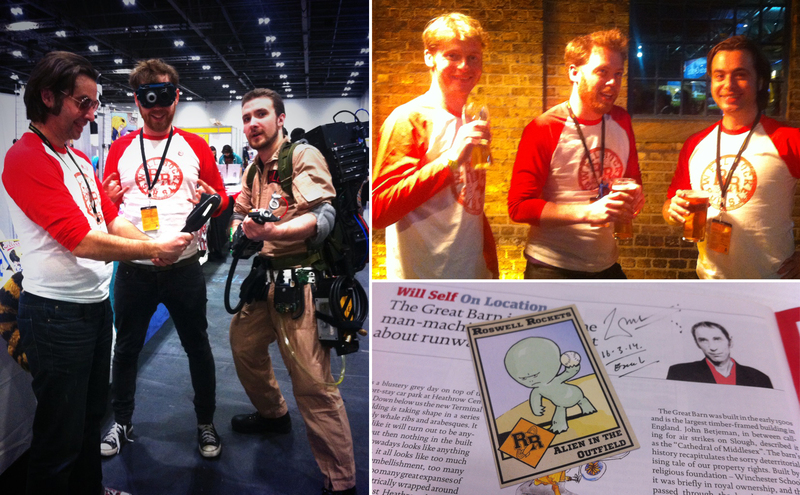 Our other convention highlights included a suprise visit from Will Self, a lone Ghostbuster who let us play with his spook hunting gear and signing a book to a couple called Chris AND Rea. Although we didn’t have much time to detach ourselves from the stand and explore the Con as fans, it was inspiring to chat with other independent creators and colourful comic enthusiasts. Some personal favourite indie discoveries included the stylish and unsettling portmanteau horror Twisted Dark and the wonderfully self-deprecating all-ages fantasy adventure Dungeon Fun. We particularly enjoyed being an active part of the Con experience and would like to thank all those people who took the time to join our mailing list, tweet about the comic or mention us on their blogs about the day. Prior to LSCC, we sent a short press release and digital review copy to some of our favorite comics blogs and websites. We were encouraged by the positive response from the online community and the fact that a number of sites took the time to write about our little independent book – never mind the fact that the reviews have been mostly positive and all constructive. Thank you to the fine folks at Big Comic Page, The Pull Box and Nerdly. We would urge you to visit them all – comments always welcome! Issue One Might Make It To Second Printing! Once again, our boundless gratitude, servitude and countless other platitudes go out to everyone who purchased or downloaded the first issue. Our first printing of Issue One was limited to 150 copies and we will be releasing the final 50 print copies of the first edition shortly. If there is still demand then we will issue a second printing with a variant cover but we really hadn’t planned for this as we didn’t expect to have been that successful in the first place. Darn success – it always catches us Northerners by surprise! Now that we actually have a readership, we have committed to a regular release schedule for the next three issues. Our plan is to release an issue every quarter and finish the story by the end of the year. Our future selves may come to regret this ambition but we really want to keep the momentum. Issue two is currently progressing well and should be available online by the beginning of July. Finally, we can now officially confirm we will be bringing Team Alien to Thought Bubble, the Leeds Comic Art Festival held 9-16 November. This week long event has been recommended to us by so many people, we’re really looking forward to it. *…although it might be more useful keeping an eye on this website instead. Next postINSIDE BASEBALL EPISODE 2: THE LATEST ALL-ALIEN NEWS!